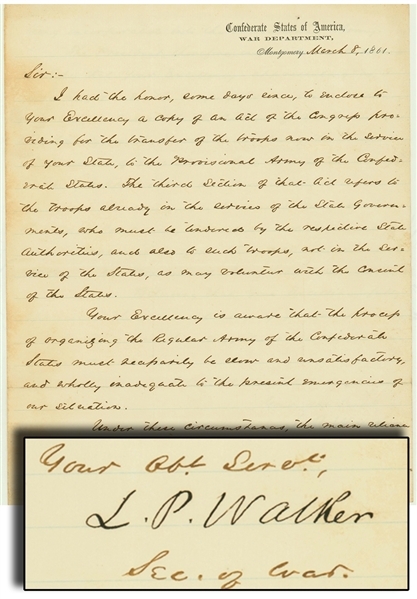 Lot Detail - The Confederate Secretary of War Writes the Governor of Georgia Asking for Georgia State Militia Troops and New Enlistees to be Transferred to the Provisional Confederate Army. The Confederate Secretary of War Writes the Governor of Georgia Asking for Georgia State Militia Troops and New Enlistees to be Transferred to the Provisional Confederate Army. WALKER, Leroy Pope (1817-18840 was the first Confederate States Secretary of War. No Southern state was in a better position to defend its borders than Georgia. Nevertheless, Governor Brown was reluctant to cede control of Georgia forces to the Confederate government for the common defense of the Southern states. His response to Walker’s request for troops was conditional, and marked the beginning of the long and often bitter conflict between Brown and the Confederate government over its authority over Georgia troops and, more generally, states’ rights.